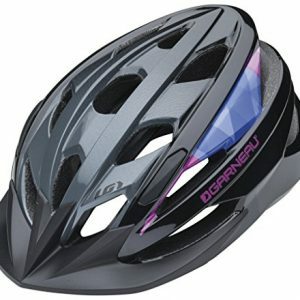 Stay safe with our Mountain & Road Cycling Helmets from Giro, Bell, Nutcase, Louis Garneau, Smith Optics. Your helmet is by far the most important cycling gear that you can purchase & in some states, the law requires you to do so. Our sleek, lightweight & impact resistant materials will ensure riding comfort for your long ride. Our products are impact tested, up-to-code constructions & very high quality. Browse our wide selection of specialized cycling helmets for sale & we are sure you will find the perfect helmet for you or your loved one. On each of our products, we have added amazon reviews to the products so you can see exactly what other cyclists say about their purchase. If you happen to not see a product you’re looking for, be sure to send us a Facebook message so we can add the product to our website for you to purchase. MULTIPLE OPTIONS TO ACHIEVE THE PERFECT FIT - The Little Nutty features an adjustable, removable spin dial strap for fine tuning your fit. It also includes two sets of pads - in 3mm and 6mm thicknesses, that work together with the spin dial for a perfect fit. EASY-ON, EASY-OFF - Easy one-handed operation makes the Little Nutty Helmet a breeze to open and close, even with gloves. The magnetic buckle is extremely secure, and nearly indestructible - no more broken buckles and no more neck pinching! It also includes a soft chin pad for extra comfort. 360 DEGREE REFLECTIVITY AND DURABLE ABS SHELL - The Little Nutty offers 360 degree reflectivity from logos, straps and our spin dial that helps you be seen at night. The helmet also features a durable ABS Shell and protective EPS inner foam lining. MULTIPLE OPTIONS TO ACHIEVE THE PERFECT FIT - The Nutcase Street Helmet features an adjustable, removable spin dial strap for fine tuning your fit. It also includes three sets of pads - in 3mm, 6mm and 9mm thicknesses, that work together with the spin dial for a perfect fit. EASY-ON, EASY-OFF - Easy one-handed operation makes the Nutcase Street Helmet a breeze to open and close, even with gloves. The magnetic buckle is extremely secure, and nearly indestructible - no more broken buckles and no more neck pinching! It also includes a deluxe soft chin pad for extra comfort. 360 DEGREE REFLECTIVITY AND DURABLE ABS SHELL - The Nutcase Street Helmet offers 360 degree reflectivity from logos, straps and our spin dial that helps you be seen at night. 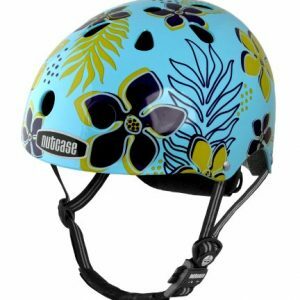 The helmet also features a durable ABS Shell and protective EPS inner foam lining. Features in-mold construction with 20 vents and inner evacuation channels. The Spiderlock Solo III stabilizing system and Steplock adjustment straps provide a customized fit. The Airdry padding is washable and sealed for enhanced durability.